Last week and in spite of very muddy conditions, the vineyard crew finished pruning our nine acre Marquette vineyard and the one acre of vines in our test plot at Meadowcreek East. 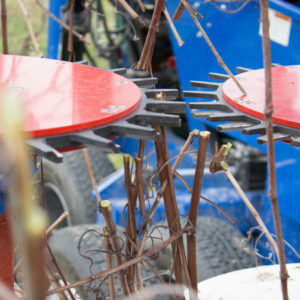 The first step was to go through the vineyard with our mechanical pruner. We did that early in the morning on Monday and Tuesday while the ground was still frozen. The rest of the week was devoted to removing the long canes that had been cut off but were still hanging in the trellis. Because the vineyard crew was working with canes that were about head level, their arms and hands were high almost all week. Everyone was pretty sore by Friday. But, think of the upper body strength they gained! This week, we will try to mechanically prune all 31 acres of the Tassel Ridge vineyard, assuming we can get the mechanical pruner into the vineyard. We will focus our energy on getting the Edelweiss cleaned out by the end of the week. That will leave only St. Croix, Sabrevois, and Brianna at Tassel Ridge to prune.